The two leads of The Boy Downstairs act like romantic ping-pong balls. While a typical rom com, Boy Downstairs likely sets a record for “will they/won’t they” moments. That indecisiveness is outright maddening at times. Failure here lies in Boy Downstairs’ inability to say anything about modern romance. It’s clearly fictionalized, with a woman working in a bridal shop (and writer aspirations) able to afford a gorgeous New York apartment. There’s no financial struggle. It’s equivalent to an HGTV house hunting show where the couple specializes in hamster massages and can afford a $3.3 million luxury mansion. 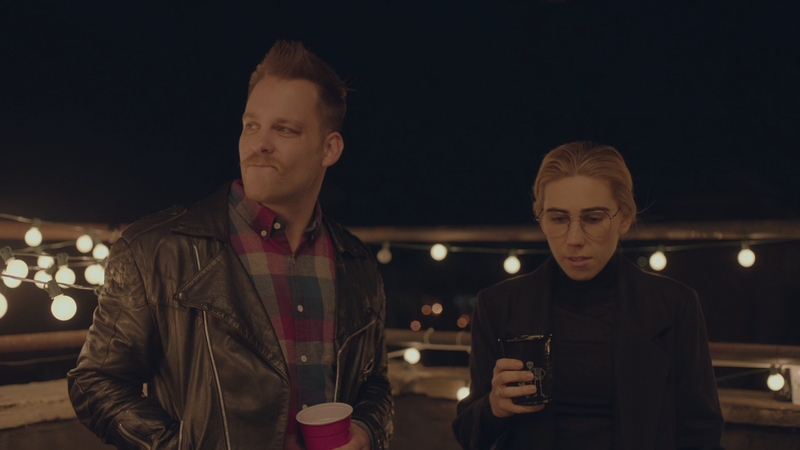 Below her lives an ex-boyfriend, that bit of fate Boy Downstairs needs to kick itself into motion. 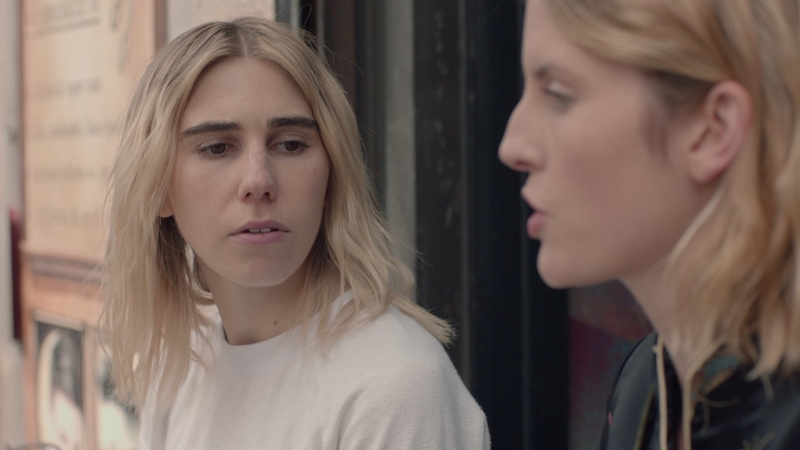 Zosia Mamet projects a gentle awkwardness in her dealings with co-star Matthew Shear. The two pair with necessary screen chemistry, dancing between emotions with goofy sarcasm and small giggles. They embody this indie’s quaint tone and mood. And it’s quiet, too. Almost silent at times. Boy Downstairs is hungry for more awkward engagements, but ploddingly fills empty story space. While honest and real, that brings a slew of dead air that adds nothing. 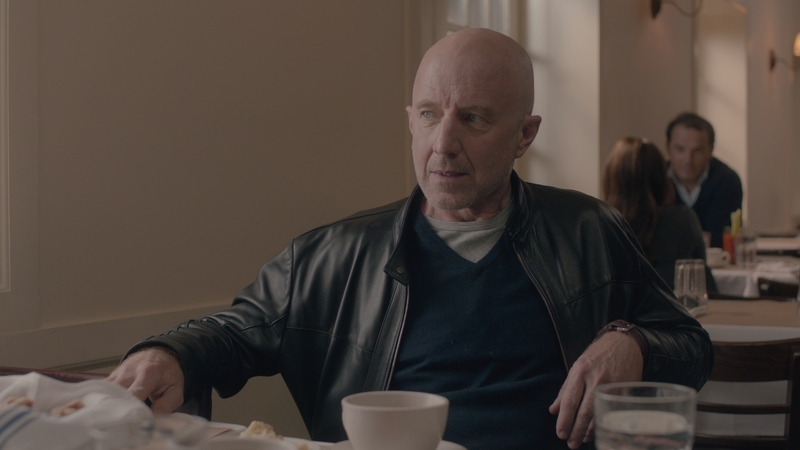 Mamet’s close friend played by Diana Irvine suffers her own relationship breakdown, if to no narrative impact. Boy Downstairs hangs whenever she’s handling her relationship entanglements. A romance for the millennial era, Boy Downstairs never works in those terms. The pairing of Mamet and Shear appear remarkably well off. Shear’s a musician without direction, Mamet hasn’t published her novel. While their interactions carry Boy Downstairs into a romantic reality, everything else comes covered by a sheen of fantasy. Too pure for a fairy tale, too implausible for the modern era. They never deal with real world pitfalls. Mamet carries this material though. 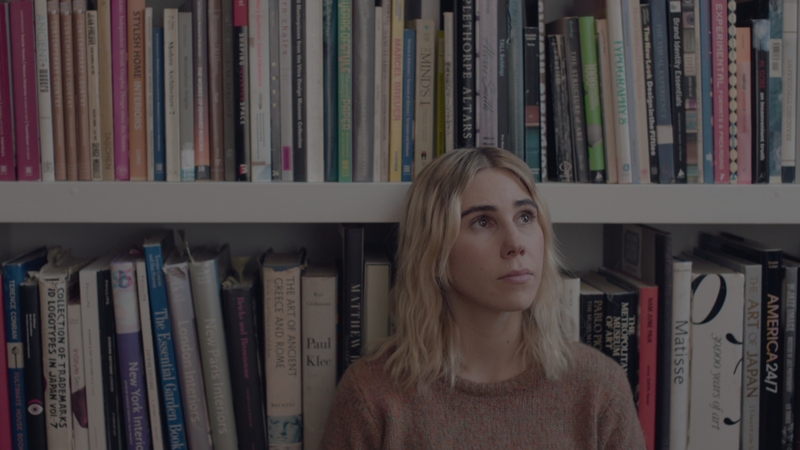 Her character’s uncertainty is frustrating, both for the audience and herself. That’s shared. 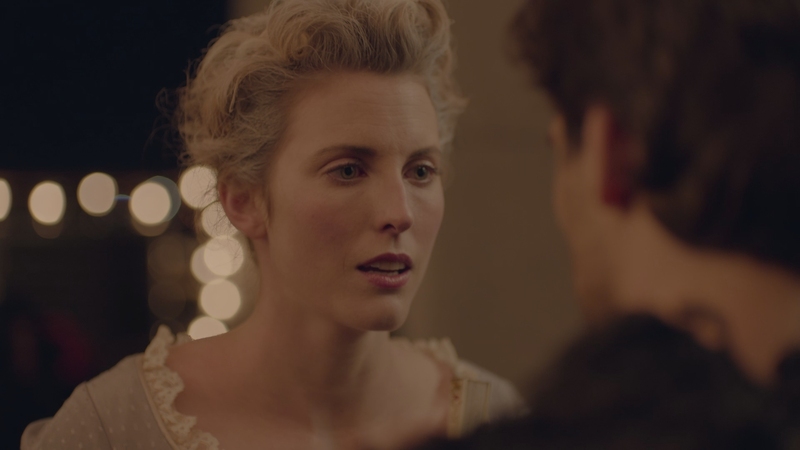 It’s a delicate performance, understated as required, and creating a likable woman who keeps Boy Downstairs energized. The same doesn’t apply to a gaudy, overcooked bit part played by Sarah Ramos, written to an extreme without any delicacy. Ramos is the only antagonism in this story, and her attitude is puffed up to fill that hole. 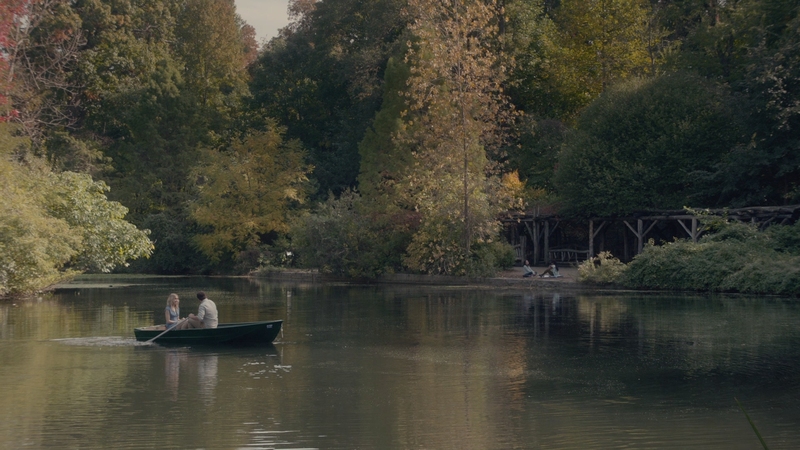 In the end, Boy Downstairs concerns two shy people of New York’s distinctive type, fighting for one another without ever admitting it. That’s something to root for, a key component for the genre. Shame the surrounding material is too hazy to support them. While typically clean in terms of its digital material, the Blu-ray isn’t made to match. Excessive banding and artifacting batters the imagery. Without dense black levels, shadows become a host to chunky, DVD-level blocking. Nothing hides this, and walls call to banding problems. To offset things, the overall imagery is bright and perky. High contrast sits right below a clipping level. Much of Boy Downstairs soaks up light with excellent results. This breeds details, including well resolved close-ups. Textural qualities show pleasing minutia. While small scale in the indie way, New York scenery gives life to the various restaurants and storefronts. Add in a dose of slightly pale color and the overall aesthetic becomes attractive. Small and dialog driven, the 5.1 mix of Boy Downstairs isn’t meant to offer much. The center holds a majority, consistent and clean in presenting these performances. Don’t count this track out though. In terms of making the city vibrant, ambiance keeps up its presence. Streets fill with traffic. Local diners and coffee shops send music to the rears. Even when in the apartments, a gentle echo reaches the positional speakers. Kudos for giving this one unexpected life. A stills gallery contains behind-the-scenes images, with a trailer to follow. 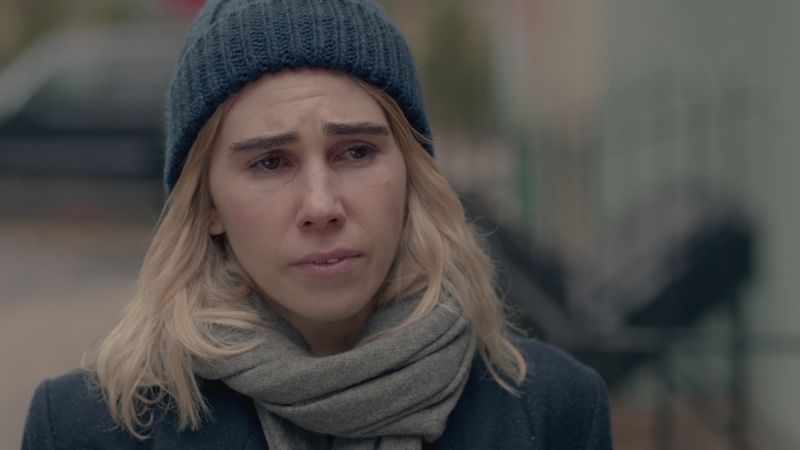 Star Zosia Mamet successfully carries the soft romantic material of The Boy Downstairs, even if the end result lacks purpose. The 15 unaltered images below represent the Blu-ray. For an additional 10 The Boy Downstairs screenshots, early access to all screens (plus the 19,000+ already in our library), 60+ exclusive 4K UHD reviews, and more, support us on Patreon.